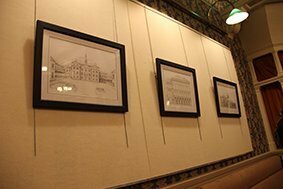 The latest Grampian Hospitals Art Trust exhibition in His Majesty’s Theatre’s Dress Circle Bar, is an exhibition of work by architect Jamie Cameron. Jamie studied Architecture at Dundee’s Duncan of Jordanston and Glasgow’s Mackintosh School of Architecture before moving back to live and work in the North East. 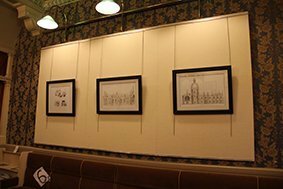 His illustrations capture in minute detail a range of Aberdeen’s beautiful granite architecture from schools through to theatres, and other well-known local landmarks. And his style distils the unique character of each subject so that each drawing is therefore a complete one-off in which the building determines how it is portrayed. “Having studied and worked in the field of architecture across Scotland, I have always enjoyed working at the drawing board in the traditional way, as opposed to the computer-based systems which are now used across the field. The direct way of working, where each line can be given a unique little twist, curve or fade, allows great artistic freedom in the treatment of each subject- the exact same drawing therefore can be made to have a completely different feel depending on the combined effect of these details. The exhibition runs from March 3 to May 24.